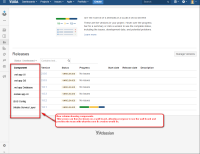 [JRACLOUD-3501] Allow Versions of components - Create and track feature requests for Atlassian products. JIRA feedback is collected from a number of different sources and is evaluated when planning the product roadmap. If you would like to know more about how JIRA Product Management uses customer input during the planning process, please see our post on Atlassian Answers. NOTE: This suggestion is for JIRA Cloud. Using JIRA Server? See the corresponding suggestion. Thanks for voting and commenting on this issue. Your feedback is key to helping us understand how you use JIRA so we can continue improving your experience. We have reviewed this issue over the last few days; however there are not currently any plans to implement this suggestion. This request is in a simlar position to JRA-846: We absolutely understand many the logic behind many of the requests for versioned components, but we strongly believe that our focus should be on making JIRA simpler and easier to use. Simply put, versions for components is likely to add complexity on a conceptual level, at a technical level (more bugs and slower performance) and will lead to a more confusing UI. Please remember that jira.atlassian.com is one of many inputs for the JIRA roadmap. You can learn more about our process here. I understand that our decision may be disappointing. Please don't hesitate to contact me if you have any questions. I am a JIRA Administrator responsible for configuring it for complex development environment. Just like the entire project, the components also have their version number. Many times we have projects made up of multiple smaller applications, DLLs or modules. Each component in JIRA should have a list of versions just like the project. That way will be able to release and schedule versions of components.